CANdispatch - Security Guard App CANdispatch – Security Guard App – Stream Data Systems Ltd.
Do you own or manage a security company and need a better way to schedule and track activities? With our CANdispatch Online Dispatch System we makes it easy to schedule agents, track activities and create reports. Protecting your clients and their property can be a tough job, let us take some of the worry out of it by knowing at a glance what’s happening with client or location. With CANdispatch you can manage and schedule mobile vehicles or stationary agents quickly and easily. We allow you to set time-specific events or allow the agents to complete activities at any time during a shift. Easily add and immediately notify agents of emergency activities. We also offer the optional Shift Scheduling Module, CANwork, that functions as an add-on application to schedule agents shifts. Schedule agents and vehicles to complete location or time specific activities using dynamic agent positioning features. It’s easy to update and add new schedules by cloning existing schedules, saving work-in-progress schedules to be published and editing existing schedules. Using email notifications employees can acknowledge and accept new shifts as well as scheduling changes. 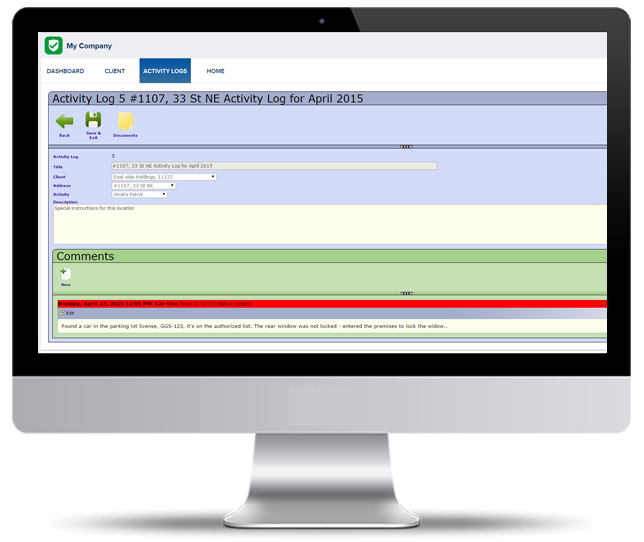 Keep track of your agent’s activities and status reports in a centralized location. Sort through reports by client and location. With our online dispatch system agents can also flag the status of a security check for review. With Dynamic Team Support if an agent is unable to complete an activity their security schedules can be shared and performed by other agents. Give your agents access to the Agent Support Dashboard through a tablet or mobile phone to track their car patrol schedule complete with locations, status and activity log. You can also provide easy access to location specific documents relevant to each client or location. Does the system track total time spent onsite? Yes! With our automatic dispatch manager you can get a monthly report of time spent onsite per location and/or agent. The agent messed up, can an administrator fix the onsite/offsite time? Yes! An administrator can fix any time problems and update comments so they are client friendly. A car is stuck onsite, can another agent continue their route? Yes! All agents can see all car schedules. They can just choose the schedule assigned to another car and continue from where the other agent left off. Can I use the CANwork module without purchasing CANdispatch? Yes! All of the CAN modules can be used independently or with each other. Login and contact information is shared among all modules. You can assign permissions to each login to control what modules they can access.